Singapore is an expensive place to visit. There’s no way around it. 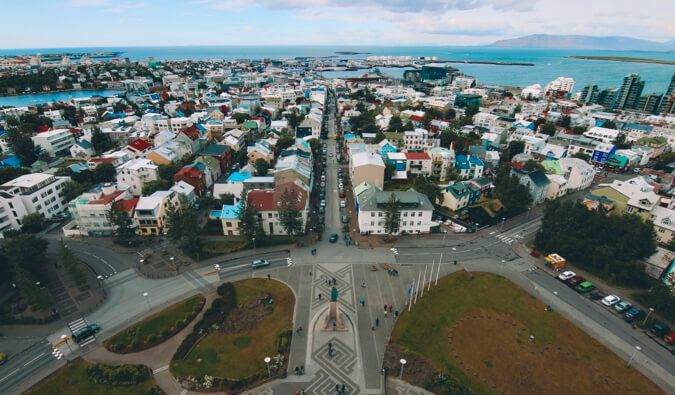 The small city state is priced relative to the United States, which is a lot more expensive than its neighbors! On a small stop-over trip, this isn’t a problem. 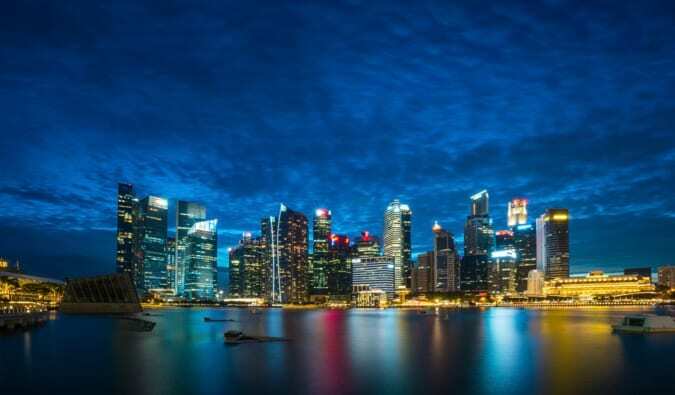 But on a big trip through the region, a trip into Singapore can elicit sticker shock, and it can turn people away if they’re trying to do the area on the cheap. If you still want to visit this country, though, there are still many ways to travel around Singapore on a budget. Singapore has many free and cheap things to do when you vsiit that that will allow you to make the most of this big city! Here’s a list of my favorite cheap and free things to do in Singapore! 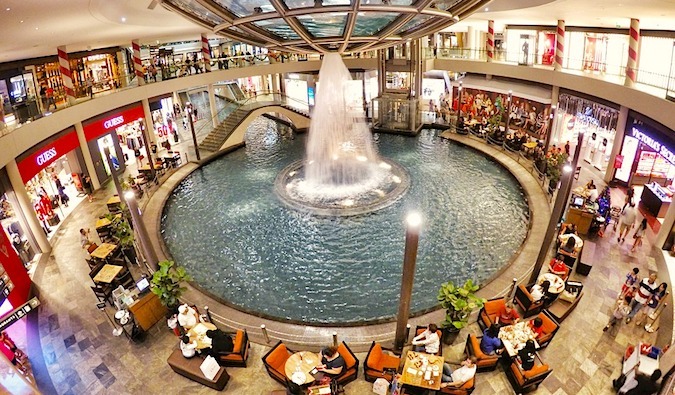 The best places to cool off in this very hot city are the underground malls where the A/C’s cranking. You’ll be able to move around most of the city and never expose yourself to the heat and humidity. Since it gets cool at night, it can save you from having to pay extra for A/C at your hotel or hostel. Plus, you can spend your afternoon wandering underground Singapore without spending any money. Singapore has some great food, but many of the restaurants are expensive. However, one of the best places to eat is the area of Little India, where great Indian meals cost as little as 5 SGD. Make sure you find the places where you can eat with your hands! They’re the most authentic and local places. You’ll probably be the only Westerner in there, though, so be prepared for people to stare. Eating at these places was still the most fun I had in Singapore. Make sure you stop off at the Tekka Center, a hawker center with Indian clothing, groceries, and food. The food here is cheap and delcious and makes for an authentic Little India experience. For a sit-down restaurant experience, head to Ananda Bhavan. It’s the country’s oldest vegetarian restaurant and is definitely worth a visit for some delicious Southern Indian cuisine. Even if you’re not a vegetarian you’ll still love it! Another great place to eat cheap food is Chinatown. The dim sum here is great, most everything is in Chinese, the hawker food is also good, and there are a few cool temples here too. This is a wonderful place to not only eat but to also wander around. You’ll be able to cut down a lot of your food budget by sticking to the hawker stalls here and in Little India. One of those food stalls is Hong Kong Soya Sauce Chicken Rice and Noodle (aka Hawker Chan), the world’s most affordable Michelin-starred restaurant. You can order a world-class dish here for under $2 USD. Be sure to eat here! Get here early as the line gets extremely long! Tian Tian Hainanese Chicken Rice is another Michelin-starred hawker stall worth a visit if Hawker Chan’s is too busy. Like Hawker Chan’s, it’s located in the Maxwell Hawker Center. In addition to exploring the Maxwell Hawker Center, you’ll want to also check out the Chinatown Complex Food Center and Chinatown Food Street. 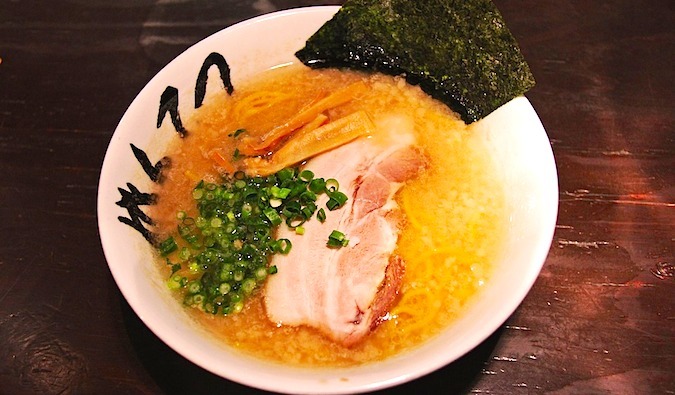 Those are the best places to find some of the cheapest and most delicious food in the city! If you’re looking for a nice place to sit down and eat, then the best time to eat at Singapore’s famed restaurants is during lunch when restaurants offer 20% off, making them a great deal. The set lunches will give you dinner food at a discount and allow you a bit more variety in what you’re eating. Make sure to check out the restaurants in the underground mall, where you’ll find even more lunch specials. The Botanic Gardens are free and are a nice place to walk around—especially in the mornings and evenings when Singapore’s tropical weather cools down a little. Early in the morning, locals practice t’ai chi on the lawn, and there are often free concerts on weekends. The Singapore Zoo is a must-see. It’s an open-air zoo, which is great because animals aren’t locked up in tiny cages. It’s actually one of the best zoos I’ve ever been to. They also offer a night tour in a different section of the park where you get to see the nocturnal animals. These activities aren’t very cheap, but if you combine them together, you’ll save a lot of money. It’s worth the price. 80 Mandai Lake Rd, +65 6269 3411, wrs.com.sg/en/singapore-zoo. Open daily from 8:30am-6pm. Admission to the zoo is 35 SGD for adults and 23 SGD for kids while the night safari is 47 SGD for adults and 31 SGD for kids. 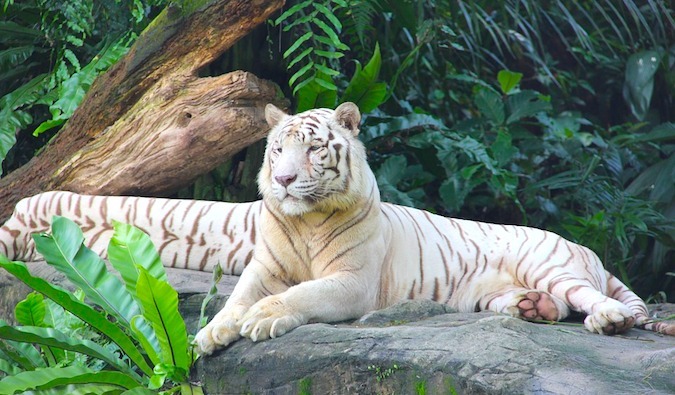 A combination ticket for the zoo and night safari is 68 SGD for adults and 48 SGD for kids. 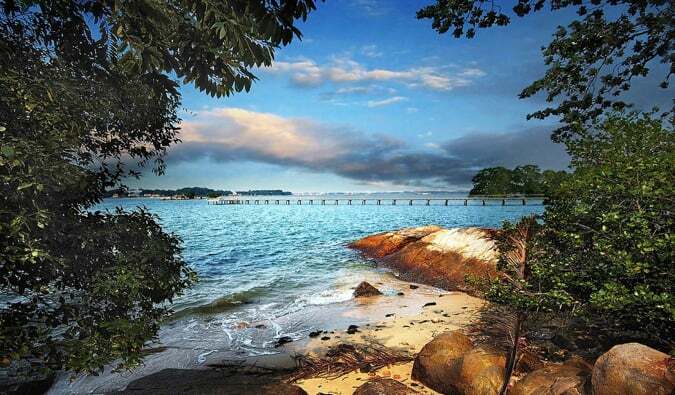 If you need an escape from the busy metropolis, head to Sentosa Island. There, you can kick back and relax on the beach. There are actually 3 beaches to choose from here, depending on what you’re looking for. 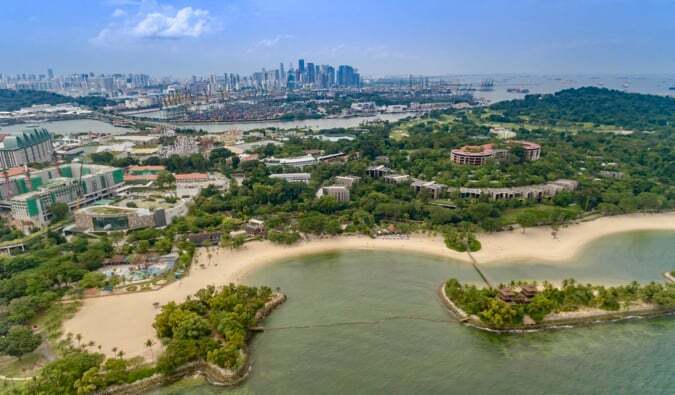 Siloso beach is where you’ll want to go for activities, Tanjong beach is a great spot to chill and enjoy a drink, and Palawan beach is where you’ll go if you’re traveling with kids. While you won’t be getting the beach experience you’d find in Thailand (there are tons of cargo ships in the water here!) it’s still a great place to escape for a day and soak up some rays. Gardens by the Bay is a 250-acre nature park build on reclaimed land. 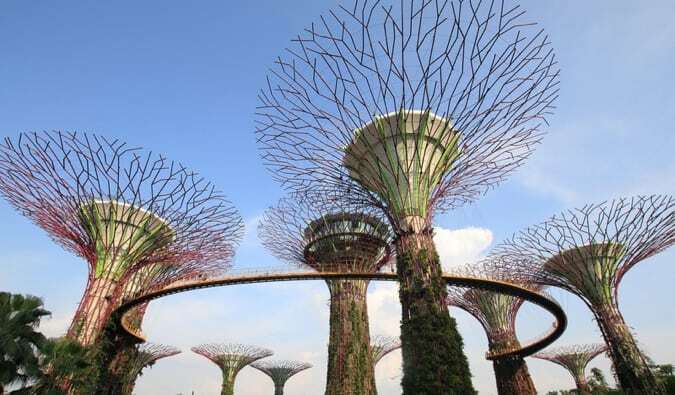 It’s famous for its massive supertrees, 25-50m-tall vertical gardens that look like massive trees. The supertrees are home to all sorts of exotic plants and ferns and make for a stunning sight. While you have to pay to explore the conservatories, admission to the supertree garden is free. While admission to the museum isn’t free, they do offer daily free tours which really makes a visit here worthwhile. This is the oldest museum in the country, having opened in 1849. The museum covers the history of the country, making it a great place to learn more about the country and how it came to be. 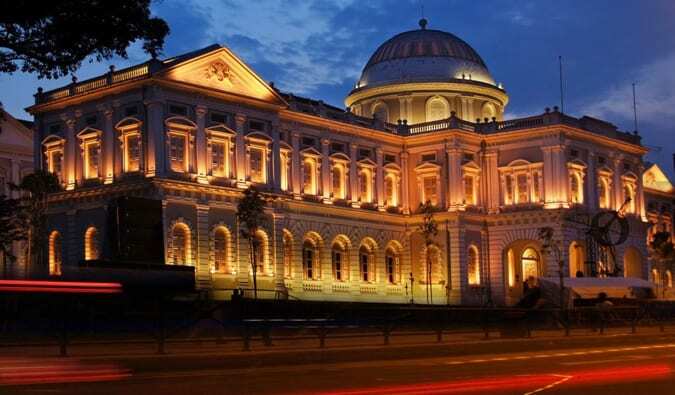 93 Stamford Road, +65 6332-3659, nationalmuseum.sg. Open daily from 10am-5pm. Admission is 15 SGD for adults and 10 SGD for students and seniors. Free tours are available at 11am and 2pm on weekdays and 11am, 1pm, 2pm, and 4pm on weekends. 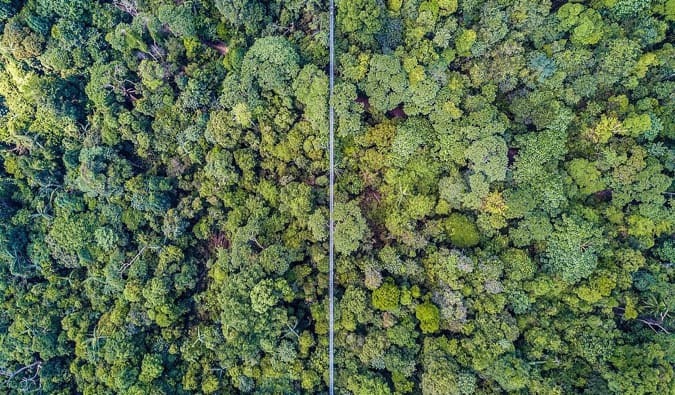 The MacRitchie Trails cover over 11km of pathways around the largest reservoir in the country. It’s a place where the locals head for a run or a hike, and it’s a great place to get out and stretch your legs if you need to escape the city. Part of the trail includes a 250m aerial suspension bridge, which offers some nice views of the surrounding area. You can rent kayaks and canoes there, as well, and if you’re lucky you might spot one of the rare flying lemurs that call the park home! MacRitchie Reservoir, +65 1800 471 7300, nparks.gov.sg. Open Tuesday-Friday from 9am-5pm and 8:30am-5pm on weekends. Admission is free. This is the largest cathedral in the country, dating back to the 1850s. The cathedral was built in the Neo-Gothic style, and it was the first Anglican evangelical outreach in the country. The cathedral’s choir is actually the oldest musical institution in the country too. During WWII, it was used as a makeshift hospital until the Japanese invaded. 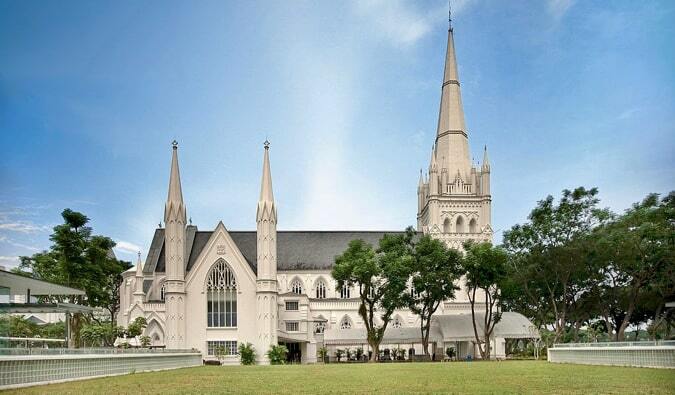 11 St Andrew’s Road, +65 6337-6104, cathedral.org.sg. Open from Monday-Saturday from 9am-5pm. Tours are free though they must be booked in advance. The merlion is a mythical creature that has the head of a lion and the body of a fish. It’s the mascot of the country and often considered the personification of Singapore itself. There’s a statue of a merlion in Merlion Park (near the Central Business District) that you can check out and snap a photo with. (There are actually 5 official merlion statues around the city, though the 2 in Merlion Park are the most famous). 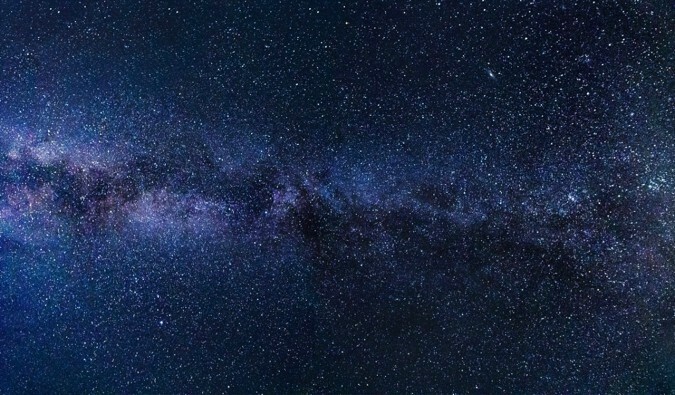 Science Centre Singapore offers free stargazing every Friday (weather permitting) between January and November. This is a really cool activity and makes for a great educational experience for adults and children alike. Just keep in mind that there is limited space, so be sure to arrive by 7:30pm to claim a spot. 15 Science Centre Road, +65 6425-2500, science.edu.sg. Stargazing is every Friday from 7:45pm-10pm. Check their website for the most up-to-date details. This wetland nature reserve is located on an island a short ferry ride away from the city. There’s a winding boardwalk you can explore as well as a large viewing tower you can climb to take in the panorama. Bicycles are available for rent outside the park as well, in case you don’t want to hike. The area was originally slated for redevelopment but the locals protested the decision and now it’s one of the last bastions of natural habitat in the area. Pulau Ubin, +65 6542-4108, nparks.gov.sg. Open daily from 8:30am-6pm. Admission is free. The museum is home to the world’s largest collection of modern Southeast Asian art. Modern art isn’t my favorite style, but there were plenty of insightful and imaginative pieces here to keep you entertained. They also have regular guided tours in English, which definitely makes a visit worthwhile. If you want to save money, be sure to visit on Friday evening when admission is free! 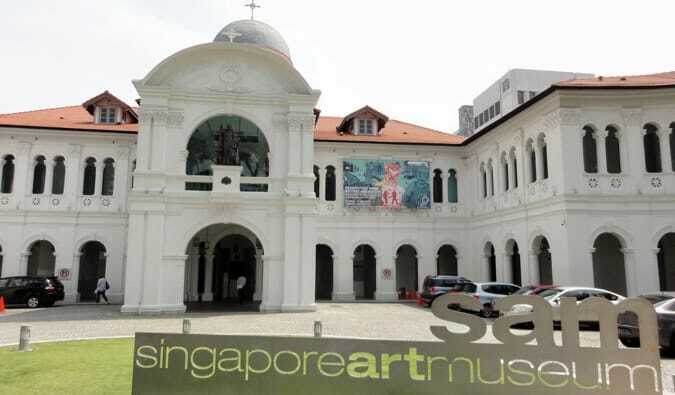 8 Queen St, +65 6589-9580, singaporeartmuseum.sg. Open Saturday-Thursday from 10am-7pm and Fridays from 10am-9pm. Admission is 10 SGD per person, though there is free entry on Fridays from 6pm-9pm. 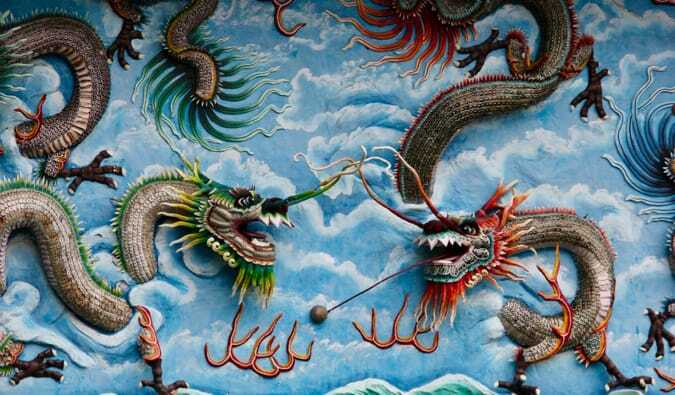 Also known as Tiger Balm Gardens, this theme park contains over 1,000 statues from Chinese folklore and mythology. The most popular section of the park is a depiction of the Ten Courts of Hell, an exhibit that shows what hell is like in Chinese mythology. The park was recently updated and renovated and is worth taking a stroll through. 262 Pasir Panjang Rd, +65 6773 0103, hawparvilla.sg. Open daily from 9am-7pm. Admission is free. 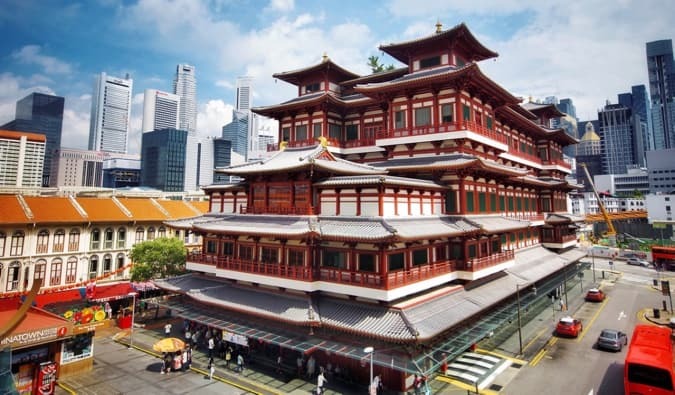 Located in Chinatown, this Buddhist temple is also a museum that is home to a tooth of the original Buddha. The four-story building was built in the early 2000s though it imitates architecture from the Tang Dynasty of China. The museum is home to one of almost a dozen “tooth relics” in the world, and while its legitimacy can be debated it’s still a cool temple to visit and explore. 288 South Bridge Rd, +65 6220-0220, btrts.org.sg. Open daily from 9am-6:30pm. Admission is free. This wetland is an ASEAN Heritage Park and another great place to escape the urban sprawl of Singapore. 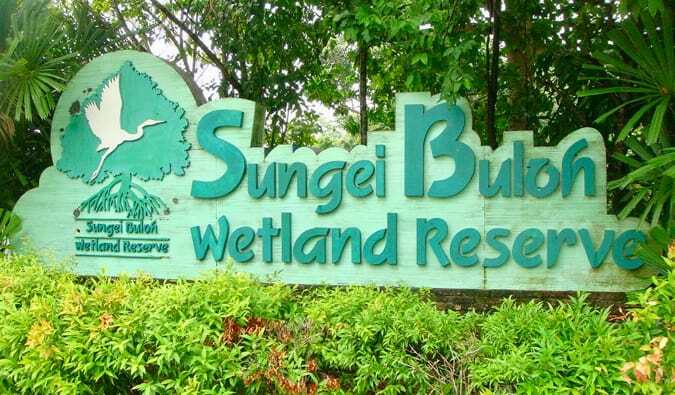 It was the first wetlands in Singapore to be made into a reserve due to its importance for migratory birds in Asia. There are dozens of bird species that call the park home, and there is also a family of otters you can spot playing in the water if you’re lucky! 301 Neo Tiew Cres, +65 6794-1401, nparks.gov.sg/sbwr. Open daily from 7am-7pm. Admission is free. Singapore may not be the cheapest city in the world, but there are still some ways to make it less of a burden on your wallet. 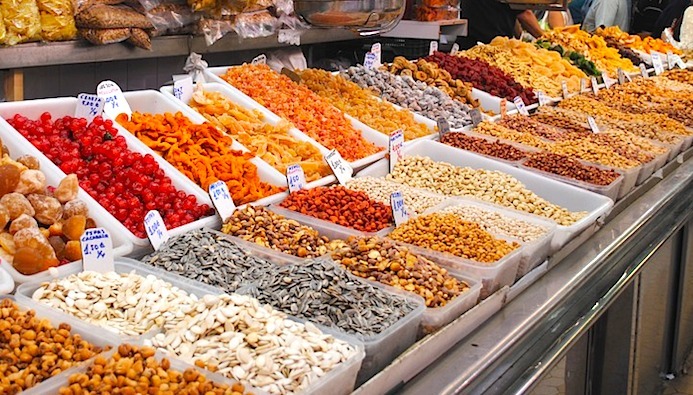 By eating cheap, walking, and taking advantage of discounts, you can easily do Singapore without busting your wallet! Do you have any tips on how to visit Singapore on a budget? Leave them in the comments! Coral Hostel – This is a quiet hostel with fast WiFi and free coffee/tea as well as a free all day breakfast! Dream Lodge – This is a cool hostel with comfy beds that offer lots of privacy. There are lockers and plenty of outlets, and each bed has a curtain, which I really appreciate as a light sleeper! Want More Information on Singapore? Be sure to visit our robust destination guide on Singapore for even more planning tips! A great round up of activities for very little. I have visited Singapore often as I have a good friend who lives there. She took me to the Changi Point Boardwalk which is on Singapore’s easternmost tip – it’s a great place to walk and take in the sunset. Thanks for the tips, Matt. I have a colleague that visited Singapore last year and loved it. It’s on my list of places to see. As it rained constantly during our brief visit to Singapore next year, we focused almost entirely on food. We were impressed by the quality and value of food at the food courts/hawker centers – Hainanese chicken rice and Singaporean laksa were some of our favorites. infact u can find food costing under $5 everywhere in singapore. eat at hawker centres and u might even find a nice plate of chicken rice for less than S$3. if u’re in chinatown, pop by the hawker centre in Hong Lim Complex or the one near Smith street. Plenty of good food all below $5. I will be visiting SIngapore with a friend in August, 2009. I find this site interesting. We will be there for 2.5 days (though I will be there for an extra day to wander alone and do the ‘arty’ stuff). 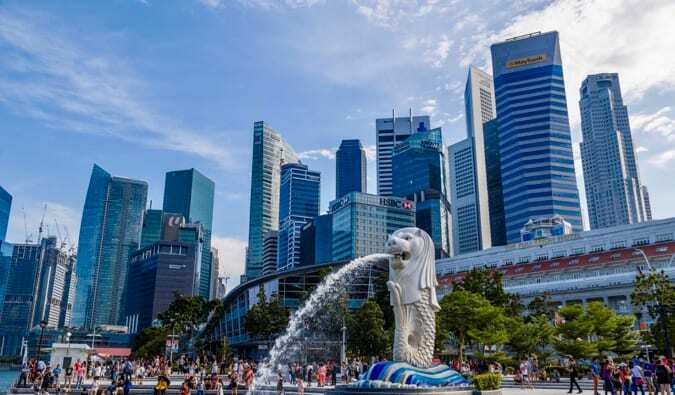 Its interestingly difficult to cram in all the wonderful things that Singapore usually has to offer in this short time – but IO guess lets see how it goes. We are stopping over in Singapore for 3 days on our way to Australia, and really looking forward to it. So far in my web research Hort Gardens with the butterfly house, and Chengi Beach have caught my eye. 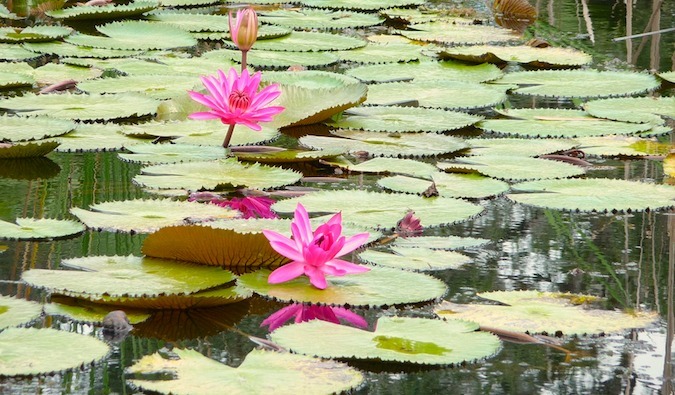 Also as a keen gardener are there gardeners in Singapore who will show you round their gardens. Does Singapore have a system of ‘friends of Singapore’ similar to New York where people who are proud of their city offer to show visitors round in exchange for a lunch, say? I have three nights coming up in Singapore and found your suggestions and readers comments useful. I’ll let you know what happens! i’m planning to visit Singapore soon, to shop 😀 I was wondering when the shopping festival is? when i could see the city + shop till i drop? good sales and such? First let me say, that (having to live here for 2 years) that yes Singapore is a clean city (in most places, but it isn’t a “green” city yet) You’d think for a city “striving” to be the best in SE Asia, they would incorporate a recycling program into their everyday living! (and stop making those poor garbage collectors pick garbage out of the garbage cans with tongs! ) Yes..food in the hawker centres is cheap, if you can figure out what it is to order..to a foreigner it is mind-boggling to say the least, nor are the hawker centre’s the cleanest places to eat! As for the people of Singapore….I find them to be the most rudist, pushiest people I have ever encountered! Always want to be first..will cut right in front of you…a walk down the sidewalk is like enduring a game of chicken..they feel that as they walk 3 abreast down the sidewalk, that they don’t have to move and would like to force you off (either into the street or onto the grass) And Singapore and Indian men…NO! It is NOT allright to stand in public on a street or on the MRT picking your nose! This is hell on earth! Are you sure you were in Singapore when you experienced that? I’m not Singaporean but I really admire the people as they are courteous and very hospitable. They are not afflicted with any racist attitude that’s prevalent in most bigger cities as they simply don’t have an idea that you could be different because of the color of your skin. They are egalitarian and very considerate. Of course, there are some deviants but that is the exception rather than the rule. Hi, I’m a Singaporean and I find your article spot on! There are definitely more interesting things to do than that though. Now, Singapore has its very own Universal Studios! You all should definitely go there! I have nothing much to say really but I must admit yes, indeed, Singaporeans have their weak points. But, so does every other person in every country. Don’t just focus on us Singaporeans. It isn’t fair. I have met such people, whether good or bad, but overall, Singaporeans are really not bad. Here’s some more ideas for more fun things to do in Singapore! I really love to walk along the Southern Ridges and all the way to Hortpark. You can see loads of monkeys and peacocks if you go in the morning to breathe in the fresh air. Cheap and awesome food just round the corner at Bukit Timah Food Centre and the small eateries around the area. Haji Lane is stocked with more ‘designer’ wears and unique accessories as the ships there are mainly opened by young designers or young entrepreneurs. Not forgetting Arab Street is just a stone’s throw away with its ‘Shisha’ culture and Middle Eastern food! i’ll be going to Sg somewhere in march next year…and i js knew that botanic garden is one of the free places to visit, so thanks to ur info Matt..
hi. i’d just like to sa y the i nfo’s great, but i live in the east, am a youth and don’t have much money! 🙂 my friends and i have nowhere to go now… bored out of my life, anyone out there, if you got something, tell me ! What about trying durians – the local fruit? I do admit that Singaporeans are not perfect, but to overgeneralized that all singaporeans are rude, nasty & dirty seems a little too extreme. As with all places, isn’t it normal to meet both the nice & not so nice people? And it’s not like we are not offended by foreigners & Caucasians who are disrespectful & sceptical of our culture & the very things that we hold dear. Having to save and travel there to visit my bf, means we have to be on a budget. 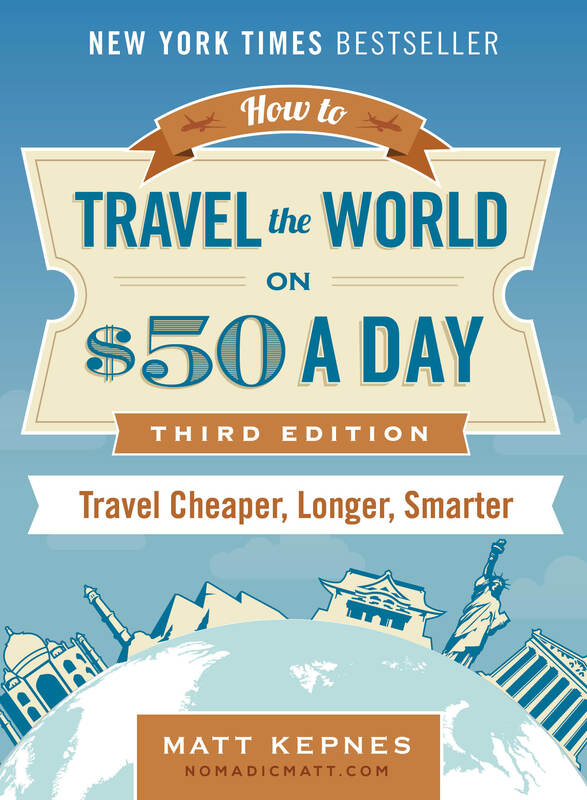 (Plane tickets are not dirt cheap). 2. MINT Toy Museum (near the Raffles Hotel): Not free but if you loved toys and is partially a geek at heart, you might like this place. I loved spotting Archies, Betty Boops, Rin Tin Tin stuff as well as Popeye and astroboy stuff in there. 3. FOOD> definitely the hawker centers in China town, Gluttons Bay (near Esplanade). The pinoy (philippine) bbq stall has yummy skewers, and black pepper beef in any hawker stall is a lip-smacker. 🙂 I personally loved the nasi lemak rice dishes with fried chicken. Oh! And.. if you ever want to try the BEST FRIED CHICKEN WINGS EVER ON THE PLANET, try going to the basement food court of Ion Mall and look for BON CHON Four Fingers Chicken. It’s to die for. I never go to singapore without hitting that place at least once. 4. Fort Siloso – you can walk around the grounds for free. Up to you if you want to fork over the entrance fee for the Battle Box. 🙂 But it’s worth the money if you do. 5. Sentosa Island – There are a lot of ‘entertainment’ places there where there are entrance fees or ride fees. But in general, it’s free. It’s nice to hang out in that area. Lots of sculptures, displays for pictures. 🙂 You might want to ride up and down the music and lights escalator at the Festive Hotel (near Universal). It’s free and it’s a favorite of mine. The lights and music make you feel like you’re part of a fantasy rainforest. You might be tempted to go to famed eating places such as Newton Food Centre (and there is certainly good food here) but beware of unscrupulous stall owners who jack up prices. 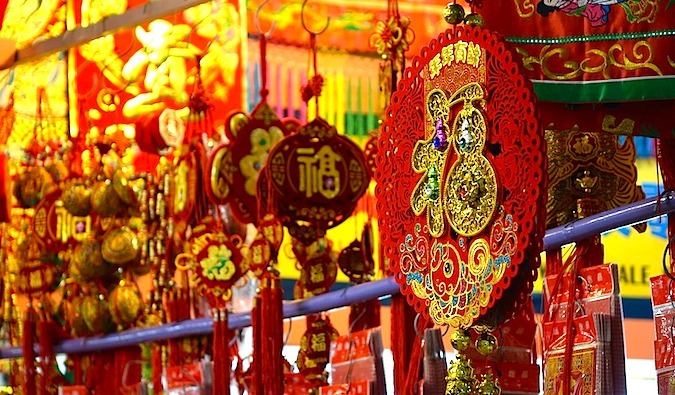 Other places where shop owners will try to rip off foreigners are the flea market (Sungei Road Thieves Market) and Sim Lim Square. These are just some of my personal favourites and in fact good food are everywhere to be found! visit the Singapore Food Trail @ Singapore Flyer! The place takes you back to the 60s. Not only will you get to immerse yourself in an atmosphere similar to the food streets of old singapore, you’ll also get to see knick nacks and charming antiques and posters from the past. I took alot of beautiful pictures the last time i went there! Not only is the ambience awesome, the food is extremely tasty. You have hawkers who go wayyy back and have been in business for years! Great This post will help me while visiting Singapore. There are lots of information regarding cheap food and other things. Hi, regarding the people of Singapore. you have to understand that it is in fact a CITY (bustling one at that! HAHA!) and busy people will be rushing everywhere, every time so if you’re looking for a place that’s all bright smiles and laughter, it’s not Singapore, I’m afraid. So you’ll be meeting plenty of super-nice people while you’re here if you’re on tour. Just think of it as New York with an Asian flare. Asians are not the most outgoing people in the world so please understand. Nonetheless, most Singaporeans love you tourists. I mean, it’s not everyday we get to see people with blonde hair and blue eyes. Get my drift? Thanks a lot everyone for the great info! My girlfriend and I will be visiting Singapore next week. We’re not the the social type, we’re the adventurous type, the risk takers type. We want to experience High-Quality time in Singapore and as much as possible, we want to do it in a very cheap way. We travel not as tourist, we want to blend-in with the locals, understand their culture and absorb their lifestyle. We really like street foods and we do like to eat with our hands -the primitive way! Vivocity mall is a great place to shop too! It’s very accessible with harbourfront MRT station directly underground. It’s quite a huge mall with a wide variety of mid to high range retail shops and a lot of nice restaurants facing the sea. The best part is the Sentosa Boardwalk that stretches over the sea, linking vivocity mall and sentosa island. It’s a beautiful bridge to go to, and good for viewing the sunset. There are some bars, an ice cream shop and a giftshop along the way. Entry into sentosa via the boardwalk is $1, slightly cheaper than taking the monorail or bus which would cost $2-3. There are nice beaches and nature trails to visit in sentosa. Resorts world in sentosa is worth a walk even if you don’t do anything there in particular. Afterall, it’s an integrated resort! There are many restaurants and a huge candy store called candylicious with towering candy trees at it’s entrance. People with a sweet tooth will love it! There are free-to-watch water/light shows at the crane dance (large mechanical cranes) and the lake of dreams that plays at 9pm and 9.30pm respectively. i’ll be travelling to singapore with my kids.so cud any one suggest of any other place apart from the night safari and the zoo. Transportation and accommodation is generally quite expensive. Getting in to museums and entering the Marina Bay Sands Hotel was also quite expensive. Singapore didn’t seem terribly expensive – when compared with other major cities – like Tokyo, London, Barcelona. Hotels and transportation are the ones that are quite high-priced. 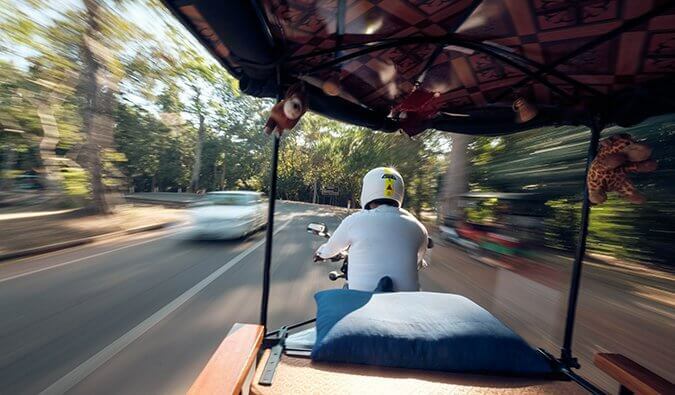 I am a local and there are certainly ways to travel in Singapore on a cheap budget. Great tips there! As a Singaporean myself, I’m surprised we can do stargazing in this brightly lit city?!? !